There is extensive research on probiotics, and their health benefits, however, the research is just scratching the surface, with a lot of aspects to be studied and understood. Even for the available information, there is little vulgarization of this, and too many physicians that don't even prescribe them. This page proposes to list the best rated probiotics, inform you about the ingredients, and about the possible health benefits of each. Whenever possible, we will cite the related scientific research. Why Is It So Hard To Choose A Probiotic? We as consumers do not have an easy job when we have to choose a probiotic supplement, partly because of the missing information in the field, partly because of poorly marketed products, and partly because of aggressive marketing of bad products. FDA, despite tremendous evidence of the efficacy, does not approve probiotics as drugs because of many objective variables. This makes even more difficult to market a product, and manufacturers have to be very careful when claiming the health benefits for their product. The poor transfer of knowledge is probably due to the relatively novelty of the field. However, there is enough published data on Internet, to allow us to understand the health benefits and the side effects. Sensing the opportunity, many less scrupulous entrepreneurs launched probiotic products without any … probiotics. What’s worse is that even reputable companies, will sell probiotic supplements with a very low CFU, and products that otherwise are great, are completely ineffective because of the very low count of live microorganisms. Unfortunately, there is no easy way to find out if a batch is good or not, so we have to rely on statistics from lab reports, Internet ratings, and anecdotal data. However, we must be very cautious when interpreting Internet ratings and anecdotal evidence since these are very easy to manipulate. A probiotic supplement has to be specifically selected for the condition to be treated, and not just randomly picked. Not all the bacteria and yeasts affect us in the same way. The CFU, which means colony forming units, and represents the number of live microorganisms per serving, is also important, but is not critical. If you need a higher dose of live microorganisms, you can always take more servings. More important than the CFU per serving is the price per unit. Remember, when comparing the price per unit, you have to compare the same strains, or the same blends. Some proprietary strains are more efficient than others; hence the effectiveness is not directly dependant on the dose. The blend of strains can also be very important, some research shows that blending specific strains into a supplement will increase the effectiveness because of the synergistic effect obtained. Some strains support each other, and when they are taken together they are more effective. The number of live microorganisms is one of the critical factors, as this is going to reflect in the efficacy of the supplement. Many manufacturers list the CFU at the manufacturing date, which is irrelevant for the consumer. If the product is expired, mishandled, or just a poor encapsulation or manufacturing process, the CFU at the purchasing date could be zero. This is just a way to decline any responsibility, and we should avoid these products. This is less of a problem, but there are a few products with strains that cannot survive in the intestine, hence the health benefits are limited. There are many products on the market that in theory are great, with a great CFU, a and a good price, but there is no data of the survival rate of the microorganisms, while passing the stomach. This critical, since the survival rate will dictate how much bacteria will actually reach the large intestine, where it needs to be. Here is a list with the top ten rated probiotic supplements, curated by Fermented Foods. We removed from the list all the products with fake reviews, and shady practices, keeping only the products without doubtful marketing practices. We don't particularly think that those products are bad, but we think it’s not fare to include them. The order of products is random, we believe all products on the list are equally powerful and of a great quality. Naturenetics is very straigthforward about their product. They say their capsule contain between 70 and 100 billion CFU per capsule. I like the fact that they don't claim the higher number, as many other manufacturers do. Another interesting fact is that they guarantee that at the end of the shelf life, (two years), their capsule will still contain at least 30 billion live microorganisms. Many manufacturers only state the CFU count at the manufacturing date, which is irrelevant for customers. Thei are also test their batches with a third party laboratory, to ensure that the batch contains the advertised CFU. Another great thing to improve the viability of the probiotics in time, is to package them independently, in a blister package, to seal them from Oxygen and moist. This will ensure a much longer shelf life, and a great CFU even at the epiry date. Here is the list of microorganisms: Lactobacillus Acidophilus, Bifidobacterium Lactis, Lactobacillus Plantarum, Lactobacillus Casei, Bifidobacterium Breve. The ingredients list is free of gluten, wheat, egg, milk, soybeans, fish, and nuts. Also, it doesn't contain any preservatives, artificial colors, flavors, or sweeteners. Hyperbiotics is another company with booming sales almost overnight. The reason is because their product is well designed, and the team behind it wanted to make, not a good product, but a great one. The blend is conceived for intestinal and digestive health, immunity boosting, and fighting Candida. At a close look we can see that many of the strains are specifically chosen for their ability to fight Candida, while others for their gut healing capabilities. What sets Pro-15 apart, besides the special probiotic blend, is a couple of things to make the delivery of the microorganisms more efficient. This means a great encapsulation and timed delivery. Proper delivery is achieved by using Nutraceuticx’ Bio-Tract encapsulation system, designed to allow safe passage through the stomach, and allow delivery in the intestine. Bio-Tract is also a great shelf-life extender. When you look at the CFU count it might seem a little low, especially compared to the competition, but the special encapsulation, and the ability to release the bacteria in the guts makes Pro-15 from Hyperbiotics very effective. If the 5 billion CFU count seems too low for you, you can try the advanced strength formula from them with 15 billion CFU, and with kiwi fruit extract. Here is a more in depth review of Hyperbiotics Pro-15. Probiotic 10 from Now Foods is, like all other products from the company, one of the most affordable on the market, yet very efficient and of a great quality. With a proprietary blend of 10 bacteria strains, and a CFU of 25 billion per capsule, it is a very well formulated product, and very affordable. Maybe this made it one of the best sellers on Amazon. Now Foods suggests that Probiotic 10 is conceived to help digestion, heal the intestinal lining, (for those prone to leaky guts), help with constipation and also help with detoxification. All of these will also get you an immunity boost, as immunity is strongly dependent on the gut health. The probiotic supplement from Now Foods doesn’t have any special encapsulation, but the strains are selected among the acid resistant ones, which ensures a safe passage through the stomach. When we consider one of the best prices per unit, we realize that this is a great product. The manufacturer suggests you to store the product in the fridge to ensure viability of the microorganisms, and you should do so, to maintain full potency until the last capsule. Primal Defense Ultra is a special probiotic supplement, combining the healing potency of bacteria, yeasts, and soil based organisms, (SBOs). Garden of Life has done a great job by putting together an amazing probiotic blend. It is probably one of the most efficient formulations, because of the SBOs, and the yeast in their unique formula. Here is the list of probiotic organisms: Saccharomices boulardii, (a probiotic yeast), Bacillus subtilis, (a soil based organism with probiotic properties), and the following bacteria normally populating the human intestine: Lactobacillus plantarum, Lactobacillus paracasei, Bifidobacterium longum, Bifidobacterium breve, Lactobacillus brevis, Bifidobacterium bifidum, Bifidobacterium lactis, Lactobacillus acidophilus, Lactobacillus salivarius, Lactobacillus rhamnosus, Lactobacillus casei. The ingredient list also contains: Barley Grass, Oat Grass, and Ionic Plant Based Minerals. One capsule of Primal Defense Ultra contains 5 billion microorganisms. They recommend starting with one capsule per day, and gradually increase the dose up to 3 capsules daily. While soil based organisms, (SBOs), are without a doubt very effective, and there are a lot of people who cured severe gastrointestinal conditions with SBOs, they are still debated, and there many people who reported getting sick from them. It looks like for people with a weak immune system SBOs might not be the best choice. Take SBOs with caution, if you have problems with the immunity, or consult a doctor before taking them. Primal Defense strengthens the intestinal lining, (Sacharomices boulardii), SBOs, (bacillus subtilis), stimulate the healthy growth of lactic acid bacteria. As a consequence, the overall immunity will dramatically increase, and intestinal health is supported. Digestive Advantage from Schiff is another probiotic containing an SBO. The probiotic SBO is a special strain of bacillus coagulans BC30. BC30 is a patented probiotic, developed by Ganeden, and you can find more information about it here. The great things about BC30 are that it is very stable, has a long shelf life, it is not very sensitive to temperature changes, and it passes the stomach, arriving intact at the targeted destination, the patient’s gut. The bad thing about it is that being an SBO, it is not as safe as bacteria naturally found in our intestines. Although, we naturally ingest SBOs daily in lower or higher doses, in some cases they can make us sick. Digestive Advantage is a single strain probiotic supplement, with bacillus coagulans as the probiotic microorganism, and with enzymes that helps our digestion. The product contains Protease, Amylase, and Lipase, to help those with poor digestion. One capsule contains 1 billion CFU bacillus coagulans. Digestive advantage is created for people with intestinal problems, and with digestion problems. This probiotic also helps strengthen immunity. Ultimate Flora Critical Care from Renew Life is a supplement with 10 probiotic bacteria, and it contains 50 billion CFU per capsule, which makes it one of the products with the highest count of live microorganisms per capsule. The blend of probiotic contains: Bifidobacterium Bifidum, Lactobacillus Acidophilus, Lactobacillus Rhamnosus, Bifidobacterium Breve, Bifidobacterium Longum, Lactobacillus Casei, Lactobacillus Plantarum, Lactobacillus Lactis, Lactobacillus Bulgaricus, Lactobacillus Salivarius. The capsule contains 30 billion Bifidobacteria, and 20 billion Lactobacillus bacteria, which is a healthy balance to treat both the large and the small intestine. Renew life created this blend for intestinal problems, for treating constipation, bloating, and for ensuring digestive discomfort. As secondary effects, people report great results with immunity, general well being, and mental health. To sum up, the great about this product are the great probiotic blend, and the relatively decent price per unit. The weakness of the product is that is not very stable to temperature changes. So make sure you select expedite shipping to avoid exposing your precious cargo to temperature changes too long. Because the Ultimate Flora Critical Care capsules are very potent, there could be some initial abdominal discomfort, but this should disappear in a week or two. There is a tremendous amount of positive reviews for Culturelle, and many doctors prescribe it for their patients. Culturelle not only is one of the recognized brands on the market, but is one of the best products for many years. So if you want a product with a lot of research behind it, and scientifically proven results, Culturelle is one of them. Culturelle contains a single probiotic strain, Lactobacillus GG, and inulin, a prebiotic fiber, which helps your intestinal microflora thrive. Lactobacillus GG, (full name Lactobacillus rhamnosus GG), is one of the most researched probiotic, and there is a patent for the strain. The great things about Lactobacillus GG are that it is resistant to stomach acid, so it can pass through the stomach unaffected, it is a normal inhabitant of the human intestine, and it can colonize it in some cases. The vast research behind it, and positive results in clinical studies, made the medical world to widely accept Culturelle, and recommend it on a regular basis. Culturelle contains 10 billion active microorganisms per capsule, and the price is decent. The product is marketed as promoting digestive health, restoring the natural balance of good bacteria, reducing digestive problems, and boosting immunity. 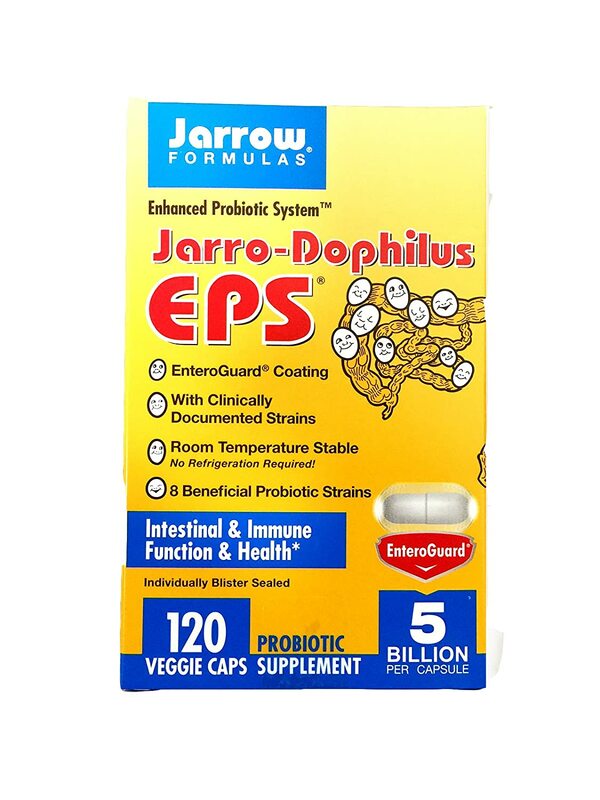 Jarro-Dophilus EPS is a probiotic supplement created by Jarrow Formulas. Their probiotic contains 8 bacterial strains, with 5 billion cells per capsule. While the count of viable cells per capsule is not impressive, the price of Jarro-Dophilus is one of the most affordable supplements. The advantage with low count per capsule is the facility to adjust the dose. You can’t lower the dose with a capsule with 50 billion viable cells, and the first time doses should always be lower, to avoid side effects. Once the body adjusts with the supplement, you can take more capsules. The blend from Jarrow Formulas includes the following strains: Lactobacillus rhamnosus, Pediococcus acidilactici, Bifidobacterium longum, Bifidobacterium breve, Lactobacillus helveticus, Lactobacillus casei, Lactobacillus plantarum, Lactococcus lactis ssp. Lactis. The blend is unique, I haven’t seen many probiotics containing Pediococcus acidilactici, and Lactococcus lactis ssp. Lactis, (formerly known as Streptococcus lactis). The special blend is aimed at helping people with a disturbed intestinal microflora, (Candida infections, or other infections with opportunistic microorganisms). The balance of the intestinal microbiota will in turn relieve digestive disorders, and improve the health of the intestine. VSL#3 is one of the strongest probiotics on the market, their capsules containing 112 billion microorganisms per unit, and their sachets a heaping 450 billion bacteria per every sachet. VSL#3 doesn’t have any breakthrough technology incorporated into their product; they instead follow strict storage temperatures, and they recommend, and actively monitor resellers to ensure proper storage and transportation procedures are followed. Every company that sells VSL#3 should store the supplement in a fridge, and ship it with an icepack. Obviously, this comes with an adjusted price tag, but all reviews about Sigma Tau’s product are positive. One of the special things about VSL#3 is the special, proprietary blend of 8 bacteria, 3 Bifidobacteria strains, 4 Lactobacillus strains, and one Streptococcus strain. The full list of probiotic microorganisms is this: Bifidobacterium breve, Bifidobacterium longum, Bifidobacterium infantis, Lactobacillus acidophilus, Lactobacillus plantarum, Lactobacillus paracasei, Lactobacillus bulgaricus, Streptococcus thermophilus. Another major difference from the rest of the market is the number of viable cells per unit. Their sachets are literally probiotic bombs, and this approach works as proven through numerous clinical trials. For more info about VSL#3 check this page. Advanced probiotic is blend of 7 probiotic microorganisms, including one soil based microorganism, and five bacteria strains. The formula includes: Bacillus subtilis, (a very popular SBO in many probiotic formulations), and the following bacteria: Lactobacillus rhamnosus, Lactobacillus casei, Bifidobacterium Longum, Lactobacillus acidophilus, Lactobacillus plantarum, Bifidobacterium breve. Advanced Probiotic touts their product as effective for: digestive health improvement, balancing intestinal flora, improving mood, helping with allergies, accelerating fat loss. The probiotic supplement is one of the best sellers on Amazon, on the abdominal gas relief section. However, despite the low price, I am not convinced about the company’s attention for detail.